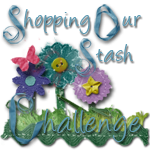 SOS - Shopping our Stash NEW CHALLENGE BLOG - Coming Soon! 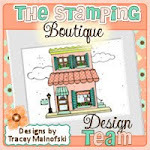 I love this new image Tracey drew for The Stamping Boutique called "Dramatic Tree". I coloured with copics and then added some glossy accents to all the flowers. I originally wanted to use buttons for all the flowers but the ones I have were too large. I will definitely be making another card & doing that though. The paper I used was some scraps from Bo Bunny's Vicky Paper Pad. The sketch was from Card Positioning Systems Sketch #215! I will be entering it in their challenge. By the way did you see the new look over at The Stamping Boutique Store? It looks great so be sure to stop by and check it out as well as Tracey's new images! Paisley Mermaid - You're so Beautiful!! Today was the craziest day ever both at work and at home and it was nice to find some crafting time so I can catch up on my TSB Blog Posts! I couldn't wait to get my hands on this image "Paisley Mermaid #2" from The Stamping Boutique the minute I saw it posted. I knew right away that I would colour her up and make a card to give to my niece Katelyn. She was alot of fun to colour with my copics and I used the cryogen white cardstock to colour on which is my current favourite because it has such a nice shimmer to it. I added some glossy accents to her mirror and cut out and mounted with oval nesties. I added some buttons and some flowers (the pink one I coloured with my copics to match) and added some pearls and rhinestones to the centers to complete. All DP is from Bo Bunny's Vicki line. I've added the sentiment "To a Beautiful Girl" inside the card too. 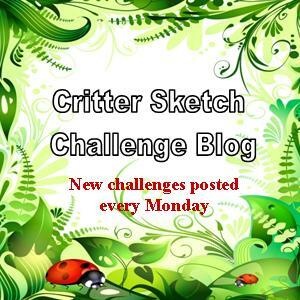 I'm so excited about our sponsor for the last two weeks of this month over at the Critter Sketch Challenge Blog!! It's Dustin Pike & his images are just so much fun!! Check out his store Doodle Dragon Studios to see these wonderful images as well as his blog here to get sneak peeks of upcoming images. I also read that he has a Blog Anniversary coming up April 21st so be sure to check it out then! I LOVE this image!! I think it would be perfect for a "Hang in There" card too! I coloured the image with copics and kept everything very simple. The paper was from a recent card swap I was in & I had these little clips sitting around for a really long time so I was glad to finally use them. I think they were by Making Memories. 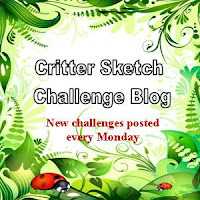 Hope you head over and play along with us at Critter Sketch, can't wait to see how you use your punches & dies. I used my new Magnolia Balloon Tilda & Happy Birthday sentiment which I coloured with copics. I added some Ranger Glossy Accents to the balloon to add some shine & more texture. 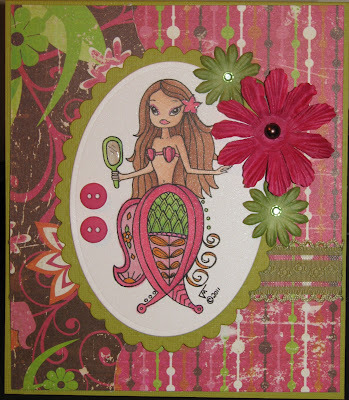 I used Bazill Cardstock and DP by Bo Bunny on the card & embossed a piece with my cuttlebug polka dots embossing folder. I added a lace doily, some flowers by Recollections & Prima and then some pink suede ribbon and blue velvet ribbon for even more texture. I even popped up the image & sentiment with pop-up dots. I have to say I LOVE this card & can't wait to give it to my friend Linda for her birthday tomorrow! I hope she doesn't see this post before she gets her card :) If she does: HAPPY BIRTHDAY LINDA!! 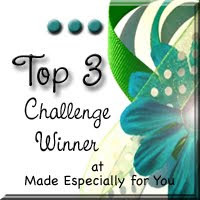 Be sure to stop by the Paper Sundae Blog and check out the rest of the Sundae Girls creations. I had so much fun colouring this image "Summer Laundry Line" from The Laundry Line series by The Stamping Boutique but even more fun when my son asked me "Why would someone's bathing suit be hanging on the line at the beach?" I just smiled and said "SKINNY DIPPING" and then got the rolled eyes and "Oh, Mom!". 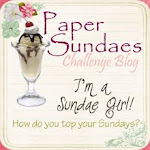 It's time for another challenge over at Paper Sundaes. It's Challenge #64 to be exact & the theme this week is Childhood Memories. This can be anything to do with children or a childhood memory that you have. Our sponsor this week is Mo's Digital Pencil and the fabulous prize up for grabs is a $20 gift certificate to their store! Great prize as there are many super cute images over there. To be honest I haven't seen many of the images until I checked out their store and will definitely be getting some more soon! I wanted to use a Mo's image for my card so I checked out their blog Mo's Digital Pencil Too and found this freebie from back in July 2009 which I believe is called Monkey Tricks! Now as soon as I saw it I immediately thought of the song "No more monkeys jumping on the bed" that we used to sing when I was little so I thought it would be perfect for this weeks challenge! It's a stretch I know but I'm going with it!! I coloured the image with copics and used design paper from a DCWV paper pack I had for awhile. I embossed some white cardstock with a cuttlebug embossing folder and then inked it with Tim Holtz distress ink in Barn Door, added some ribbon, two brads and a sentiment to complete it. Now I know he's not exactly jumping on a bed but that's what it reminded me of and besides he's a super cute monkey! Happy Sundae & be sure to check out the rest of the Sundae Girls creations over at the Paper Sundaes Blog! 3. Create a project and post it on your blog and then link it to the Inlinkz widget at the bottom of the DT Call Post. 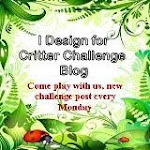 There is a specific image you need to use for your creation so you need to email April (april_lower@yahoo.com) or Melanie (newbymom@embarqmail.com) to get the image. The deadline to enter is April 15th so hurry & get your creations entered! Can't wait to see what you come up with!! Here's a card I made with a fabulous image called Peter da Puppy from one of our sponsors Robyn's Fetish. I coloured this digi image with copics and then cut out with Nesties. The DP was from a card swap I was in awhile back over at SCS. I used my swiss dots cuttlebug embossing folder to emboss the background and added some buttons and a sentiment from the CC Designs Spring kit to complete it. I love this image, it's just too cute!! Perfect for spring. I can't wait to see what you come up with and which fancy fold you will use! As mentioned I used the Joy Fold Card for my card using a FREEBIE image from DUSTIN PIKE!! I love his creations they are so cute & fun. I used Birthday Bear from a freebie back in September 2010 which I've had for a while. Over at The Stamping Boutique we are celebrating our fabulous DT Leader Christy's Birthday! To do that we are having a Blog Hop to celebrate with cards that we have made to send to Christy. If you arrived here from Colette's blog you are on the right track!! If not head over to the beginning of the hop which is Tracey's (our amazing TSB artist and designer of all TSB images). Here is my card using The Stamping Boutique image "Audrey with Cupcake". I paired my copic coloured image with design paper from Bo Bunny called "Alissa Look at Me". I just loved the pinks and blues & as soon as I saw it I knew I had to get it. I embossed my pink cardstock with a cuttlebug embossing folder and decided to try something new with this fantastic pink suede ribbon I recently got. I hand-stitched down the center of the ribbon and then pulled the thread to gather it. Once gathered I mounted it with scor-tape (I sure hope it's still holding when Christy receives it) and placed it on my card. I added some pink and blue flowers with little button centres to finish it off. HAPPY BIRTHDAY CHRISTY!! 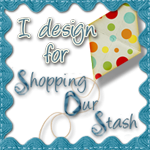 I hope you had a fabulous birthday and enjoyed your birthday blog hop. Thank you for being such an amazing DT leader! Your next stop on the hop is Dardi's Blog! Wait to see what she has in store for you! Have fun!